Jack Bauer Vs. The Obama Adminstration . . . This January the clock starts ticking again . . . but this time around, will we see a kinder, gentler Jack Bauer? On Sunday January 10th 2010, America’s favorite son returns to face another day of intense action and suspense-filled plot twists and turns. Yes, Jack Bauer will blast his way through New York in order to save the city from another looming terrorist threat – – or die trying. But with the eighth and possibly last season of “24” also comes some real-life mystery and suspense: this season marks the show’s first under a non-Republican administration. 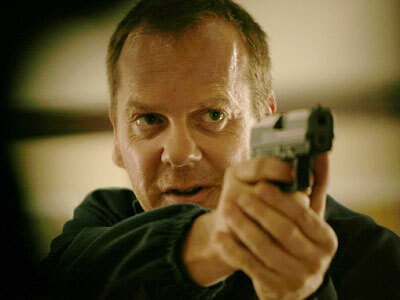 “24” first debuted on November 6, 2001 – – nearly two months after the terrorists attacks of September 11th and during President Bush’s first year in office. Though the timing was purely coincidental, the parallels between the show’s fictionalized government and its true to life counterpart are abundant. Throughout the series’ development, Bauer and the fictional Counter Terrorism Unit circumvented Constitutional law by making unwarranted arrests, conducting vicious torture sessions and illegally detaining suspected terrorists – – many of which were of Muslim decent – – all in the name of maintaining national security. Sounds familiar? Yeah, I thought so too. While some coiled back at the amount of torture depicted in the show, the majority of Americans fell in love with Joel Surnow’s brainchild, propelling Kiefer Sutherland’s Jack Bauer into a cultural icon and unofficial American hero. Why? Channeling the great Ric Ocasek of The Cars, “24” was just what the nation needed. The public’s desire for justice following the 9/11 tragedy and the “either you’re with us or against us” attitude prevalent during the Bush Administration laid a perfect foundation for “24” ratings success and instilled faith in the government’s ability to win the war on terror. Think about it: the show debuted a gritty set of characters and intense story lines based on real-life situations – – situations where, despite suffering collateral damage, America always wins. Each and every week, Americans tuned in to see government agents going above and beyond the call of duty, even to the point of sacrificing their own family and lives, to destroy the evil elements in the world that threaten freedom and liberty. And the American citizens that watched “24” religiously hoped that, for their sake, that art imitated life. Now, “24” prepares for life under the Obama Administration, a cabinet that promotes civic responsibility in the face of international diplomacy. Obama closed Guantanamo Bay and now searches for an alternative place to put the detainees, Congress debates the need for the Bush-instituted Patriot Act and the White House continues to develop stronger relationships with Muslim-based states across the globe. How will viewers receive the show’s cavalier “whatever it takes” attitude in light of the current political climate of the nation? Tune in on January 10th to find out the answer. Timely article; great tie between entertainment and politics. You forgot to mention how “24”‘s ratings and critical acclaim plummeted along with the nation’s morale as we sunk deeper into war and a faltering economy, though. Although that may have had something to do with lackluster writing and storylines, too. Good point. I guess once Jack Bauer “died” the show’s ratings died with him. Or maybe it was when they killed off President Palmer. I still smart from that one.